First, it’s best to find a consistent sleep schedule, meaning you turn out the lights at night and wake to your alarm at the same time everyday. Some even suggest that you even do this on the weekend. Our body loves this consistency and as you adopt your schedule, your body will begin to get tired and then will be ready to wake at the same times each day, helping you to not only get a good night’s sleep every time you hit the mattress, but also to feel more rested when you wake for your day. There is a reason why the sky turns a dark hue of blue or even black: we were meant to sleep when it gets dark outside. If you feel like you are having trouble sleeping, you may need to eliminate the sources of light in your room. Light sources can include alarm clock displays, computer lights, cell phone screens, light from the street light outside. For a better night’s sleep consider moving all your electronics out of your bedroom or turning them off. Also, invest in some darkening curtains or shades. When you have these, you are able to control the lighting of your environment no matter how lit it is outside. Controlling the light of your environment also includes letting light into your room when it’s time to wake up. Improving your environment includes controlling the light exposure in your room, as well as the temperature, noise levels, and the general and overall feeling of your room. To improve the environment in your room, first choose another room for the activities other than sleep and intimacy with your partner: Work should not be done in the room in which you sleep. Your bedroom should be used, decorated, and oriented only around sleep. Also, most sleep better in a cool room, around 65 degrees Fahrenheit, rather than one that is hot. If you have an air conditioner, be sure that your room is getting it’s fair share of the evening cooling. In addition to an air conditioner, you can install a ceiling fan that will help to keep you cool all night and the air moving and fresh around you. 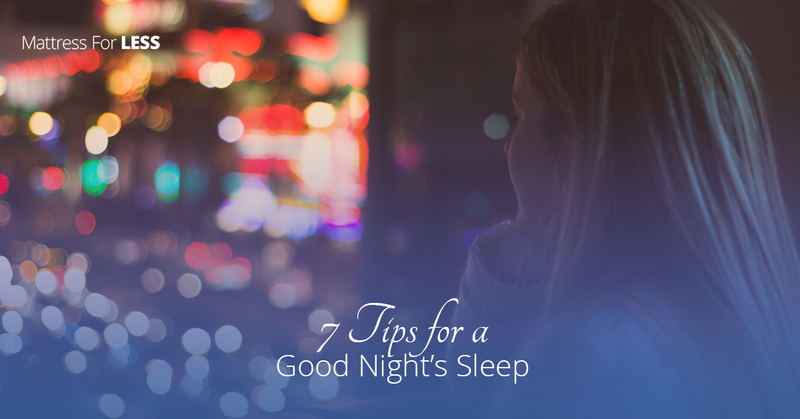 These are just a few tips for a good night sleep. You also need a comfortable mattress. If you live in Newington and need a new mattress, head over to Mattress For Less. We have a wide variety of affordable mattresses that are sure to help you get a full and restful night sleep. We offer mattresses from the leading brands and are currently having an overstock sale: Shop products that are up to 70 percent off. Besides mattresses, we also offer headboards, bed frames, adjustable bases, pillows and much more. Come over to our Newington location and find a mattress that will help you get the rest that you need and deserve.